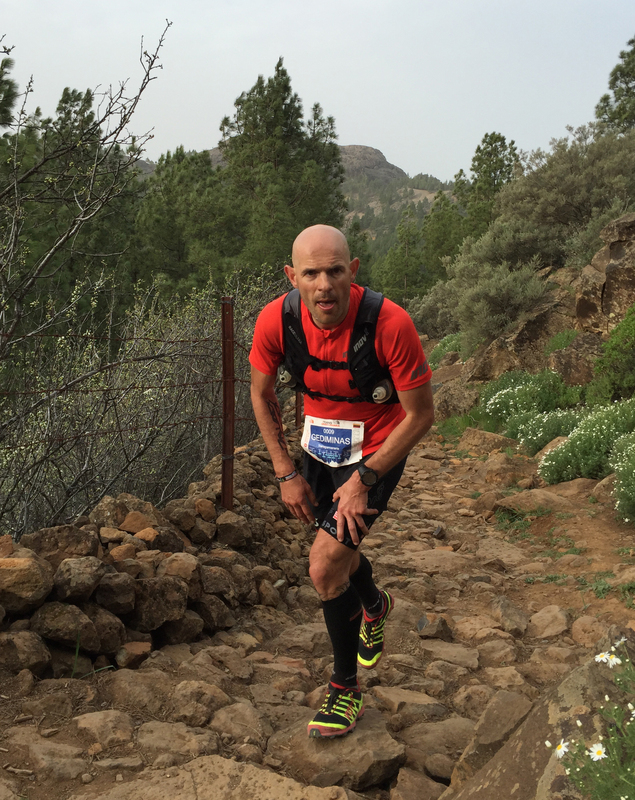 The North Face Transgrancanaria [128km] took place this last weekend on the island of Gran Canaria in the Canary Islands. This was the third race in the Ultra Trail World Tour and the first UTWT event in Europe. Lituanian Gediminus Grinius and the Catalan Nuria Picas took out the wins with a new men’s course record of 14:23:27 and a second successive win for Picas in 16:53:27. Grinius bettering Ryan Sandes course record by four minutes despite the additional three kilometers and Picas only nine minutes slower than her win here last year. With a race start that was one hour earlier than last year at 23:00 it might have made life just that little bit easier for the runners. But what a difference in temperatures to last year, it was much warmer during the night but a strong wind might have proved deceiving for some. The men’s race was a story of who started out conservatively and probably most importantly kept on top of their hydration and nutrition plan. It’s safe to say looking at the eventual podium that these guys played it safe with none featuring in the early leaderboard. It was a war of attrition out there. Winner Grinius never troubled the top five until around just over half way. Sondre Amdahl was the early leader pushing the pace from just over 10km and being chased down by a pack consisting of Iker Karrera (dropped at Tunte – 94km with stomach issues), Yeray Duran (dropped just after Artenara), Yan Long-Fei (dropped at Garanon with headache issues) Cyril Cointre and Frenchman Aurelian Collet who later lost over one hour being mis-routed. 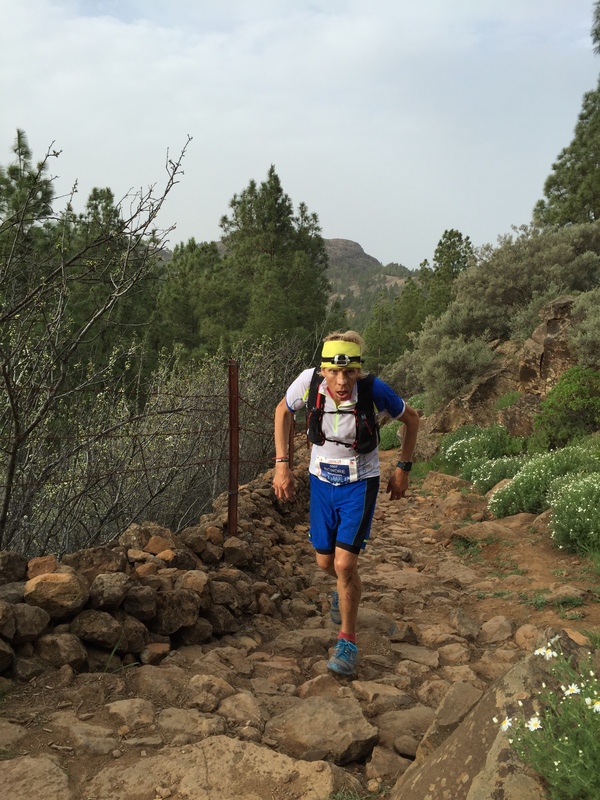 By the time they reached Teror at 57km and with over 6 hours of running the field had settled, Amdahl stormed into the aid station and stormed out again in extremely quick fashion and he was flying with a 8 minute lead over second placed Yan Long-Fei. Karrera and Cointre were six minutes behind and running strong although Karrera looked like something was paining him, was this the early signs of what was to become of him later? Grinius and the Swede Didrik Hermansen cruised in together and were fast out again. in the ladies field Picas came into Artenara with just over 7 hours gone on the clock and was met by her mother and father who had just arrived. She looked cool, calm and efficient as she took in fluids and food and sped off across the village square as the market traders were setting up their stalls. Caroline Chaverot, a mother of three and in her first race of over 100k, ran into the aid station 28 minutes later not stopping at all. She was to stay in second throughout the race despite a troubling knee injury, getting lost (adding on 3 to 4 km) and stopping several times with stomach problems. Andrea Huser and Emily Lecomte were the chasers being 8 and 17 minutes behind Chaverot. At Garanon (94km) it was starting to warm up significantly and with a strong wind this might have been a deceiving factor for many. Long Fui San was leading now with Grinius and Karrera in second and third within a minute of each other. Amdahl suffering for his early hard pace had dropped back to fifth and was looking over his shoulder with the leading American Anton Krupicka literally 50 meters behind. Krupicka would later move up to as high as fourth but was unable into break the podium spots. Didrik Hermansen and Antoine Guillon looked strong at Garanon and were able to close down the last two podiums places but not a strong and capable Grinius who was not going to relinquish his first major and well deserved victory on the UTWT series. Picas showed why she is fast becoming an unstoppable force on the women’s ultra running circuit. She led practically from start to finish, despite by he own admission a lack of energy at around 50km. 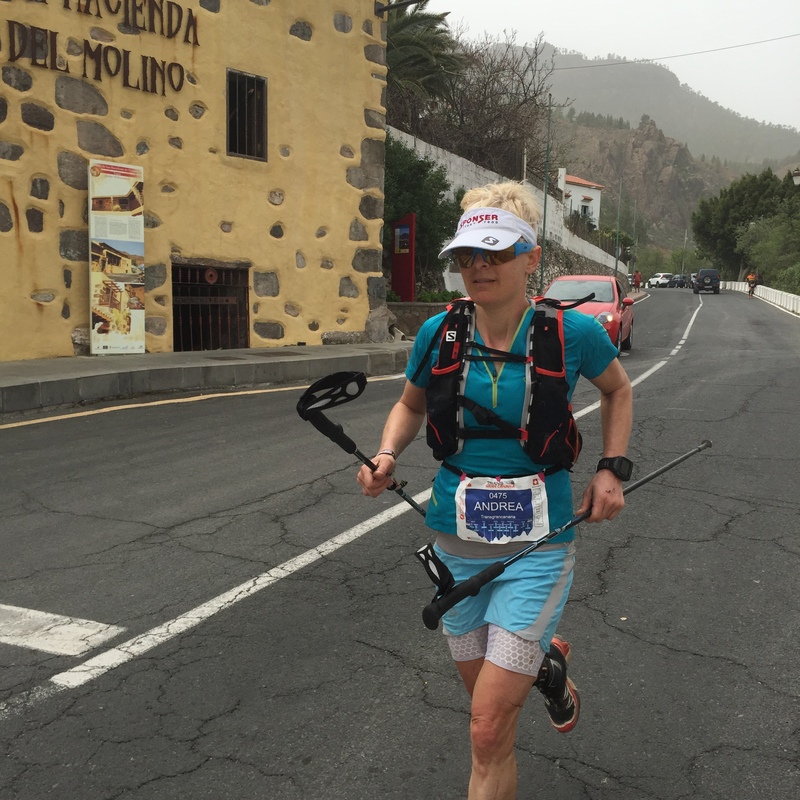 She had the desire to win and push on and push on she did to claim her second TransGrancanaria title in a row. There is little more to say than she controlled this race from start to finish. Chaverot showed strong determination and courage to battle on through her own challenges and finish in fast time. China’s Dong Li looked down and out at Tunte and I for one thought her race was going to be soon over. But some how she revived, fought and took third place from the Swiss Andrea Huser who was 26 minutes ahead to claim that final podium spot. 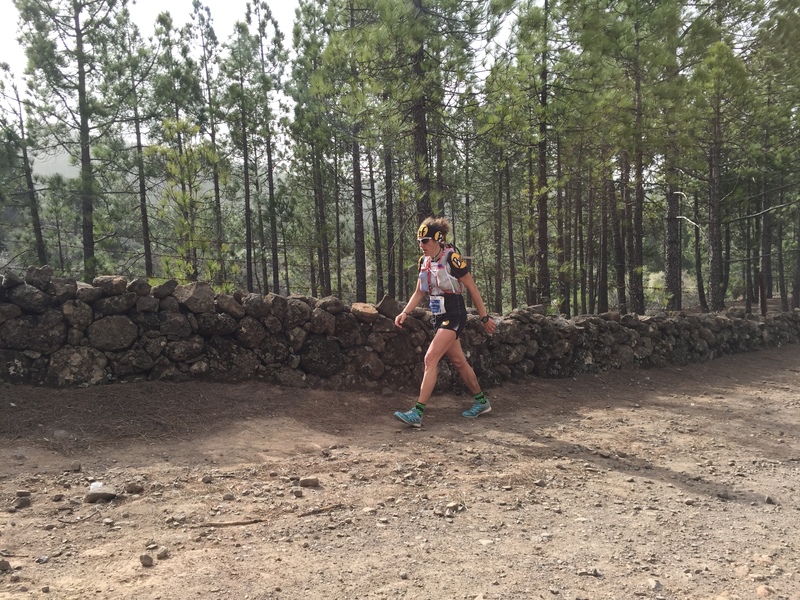 Manu Vilaseca looked tired at Tunte and was being chased down by Lucinda Sousa and Ester Alves who were only two minutes behind her but Vilaseca obviously revved up her game and comfortably took fifth by a 29 minute margin.